How to play the game (rules and piece movement), Principles of good play (including piece development, center control, King safety, material values, and space), tactical strategies (including Pins, Skewers, Forks, Discovered Attack, and Double Attack), strategic strategies (including pawn formations, open vs. semi open files, Knights vs. Bishops, and blockade), and Opening, Middle, and Endgame play. The course will also teach tournament play including time/clock management, keeping score (capturing the game on paper), and good sportsmanship/etiquette. Students will progress from Novice (learning how the pieces move) to tournament-ready players. 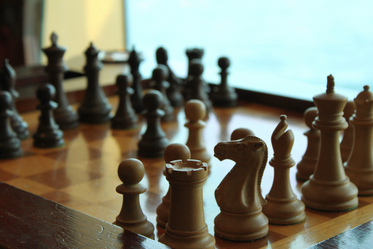 The idea is to meet the player where they are and help them progress through the levels of play: Novice (no idea what chess is), Beginner (can play a game following the rules), Developing (can display command of the Principles of Good Play), Tournament Ready (demonstrates understanding of Open, Middle and End Game play and play according to tournament requirements), Accomplished (can leverage Tactical and Strategic Principles – obtain 1400 USCF rating or equivalent). Great for all age levels! No matter what your level of knowledge, if you want to improve your Chess game, this is the class for you. Marty Klubeck is the founder/director of the Niles Community Library Chess Club and is the USCF Chess Club Director. Please bring a notebook and pen for note taking! Photo used under Creative Commons from Prayitno/ more than 1.5 millions views: thank you!